Do Thiazide Diuretics Confer Specific Protection Against Strokes? Several large studies suggested that therapy with thiazide diuretics confer a particular benefit in reducing the risk of strokes that seem to be, at least to some extent, independent of the blood pressure–lowering effect. Such a cerebroprotective effect was documented not only with monotherapy but also when diuretics were used in combination with other drugs. The cerebroprotective effect does not seem to be shared by other drug classes, such as the β-blockers or the angiotensin-converting enzyme inhibitors in patients without manifest cardiovascular disease. Since stroke is one of the most devastating sequelae of high blood pressure, the data in this review article by Messerli et al strongly favor the use of low-dose diuretics either as initial therapy or in combination in all hypertensive patients at risk for cerebrovascular disease. Low back pain is highly prevalent in the United States and extremely costly in terms of health care expenditures, lost wages, and disability. 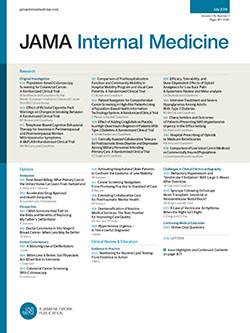 In a randomized controlled trial of a self-management program compared with usual care at university-affiliated neighborhood health centers and an emergency department of an inner-city public teaching hospital, Damush et al evaluated the effect of a self-management program for low-income primary care patients with acute low back pain (defined as symptoms lasting <3 months) from inner-city neighborhood health centers. According to their findings, the authors conclude that a self-management program can improve and maintain functional status, mental functioning, and self-efficacy to manage future symptoms for 1 year among primary care patients with acute low back pain living in the inner city. Although computerized physician order entry (CPOE) reduces medication errors among inpatients, little is known about the use of CPOE in primary care. Weingart et al studied 3481 consecutive alerts generated at 5 adult primary care practices with a common order-entry system, including 189 detailed medical chart reviews. Physicians overrode 90% of drug allergy and 89% of high-severity drug interaction alerts. Physicians were less likely to prescribe an alerted medication if the prescriber was a house officer or if the patient had many drug allergies; they were more likely to override alerts for renewals compared with new prescriptions. Study reviewers judged that 37% of alerts were inappropriate. The authors conclude that CPOE systems in primary care should suppress alerts for renewals of medications that patients currently tolerate. Metformin, a medication used to lower glucose levels in patients with diabetes mellitus, has long been thought to increase the risk for a metabolic disorder known as lactic acidosis. This review summarized data from all known comparative and observational studies lasting longer than 1 month and found no cases of fatal or nonfatal lactic acidosis in 35 619 patient-years of metformin use or in 30 002 patient-years for those not receiving metformin therapy. Average lactate levels measured during metformin treatment were no different than for placebo or for other medications used to treat diabetes. The authors conclude that there is no evidence at present that metformin is associated with an increased risk for lactic acidosis if prescribed under the study conditions, taking into account contraindications. Few studies have examined the relationship between predischarge initiation of lipid-lowering therapy and long-term use. Using the Evaluation in PTCA to Improve Long-term Outcome With Abciximab GP IIb/IIIa Blockade (EPILOG) trial data set, Aronow et al performed a retrospective propensity-analyzed cohort study of patients who underwent percutaneous coronary intervention for stable or recently unstable coronary disease and who did not receive lipid-lowering therapy at the time of admission and survived to hospital discharge. After 6 months, 77% of patients who started taking lipid-lowering agents before hospital discharge continued taking therapy compared with only 25% of those discharged without receiving these agents (relative risk, 3.17 [95% confidence interval, 2.88-3.41], P<.001). Inpatient initiation of lipid-lowering therapy is a strong and independent positive predictor of subsequent use. Inpatient initiation of lipid-lowering therapy appears to be an effective strategy for bridging the gap between current medical knowledge and practice.